When Gail Simmons, she of Top Chef and Top Chef Desserts fame, was at Book Larder last week, someone in the crowd asked where she likes to eat in New York. It was at just that moment that she asked me to take a bowl of egg whites into the back room with the hand mixer for a good whipping. (This was something we had worked out that I would do ahead of time, she was not being bossy.) I heard her say “ABC Kitchen” and then did not hear the other suggestions because the door was closed and I had an earful of mixer. Later, after most of the people had left and she was signing our books, I told her that I would be in New York for a quick stop before my college reunion, that I am a vegetarian, and asked her where I should eat. She again said ABC Kitchen. So the moment I got home, I checked out the web site and put an email out to a college friend asking if she wanted to check it out. As it turns out, we will most likely go somewhere else but looking at the ABC Kitchen menu online, my eyes got stuck on a number of dishes. The “entrée” section is all meat but almost all of the pizzas are vegetarian as are a few of the pastas. (Please tell me I am not the only one who enjoys looking at restaurant menus.) And then this: roast carrot and avocado salad, crunchy seeds, sour cream, and citrus. I had to make that. I think my love for salad has been well documented on this site. I could happily make it my life’s mission to introduce people to really good salad. No boring overdressed greens here. No iceberg lettuce and bottled dressing. And really, my plan was to have no greens at all in this beauty. But whenever I make salad, especially if it is for friends, I make a lot. And then I add to it. I eat a lot of salad and I want to be sure there is enough for everyone. (I have a chronic fear of not cooking enough food. Yes, I am Jewish.) I had two friends coming over for dinner and as I was eying the salad bowl, it looked a little skimpy for three so I threw in a handful of spinach. It was nice with the greens but I think it would have been better without. So what did I do? I cut carrots into diagonal coins, drizzled them with olive oil, salt, and pepper, and roasted them until they were just a bit brown. I cut a huge avocado into healthy chunks, suprêmed a grapefruit and two tangerines and saved the juice that I squeezed from the membranes. I used some of that juice, a dollop of crème fraîche, and touch of salt for the dressing. I made the seeds from Tara’s site that I have been wanting to make ever since I first ate them sprinkled over rice at Nettletown, and even more so after I heard the incredibly sad news about Christina Choi. Those seeds, which I am tempted to put on everything, garnished the salad beautifully. I made this salad again with arugula instead of spinach which I liked better. Still, I think it would be best with neither. Preheat the oven to 400ºF. Place the carrots on a baking sheet. Drizzle with the olive oil, a large pinch of salt, and a few grinds of pepper. Roast in the middle of the oven until the carrots are brown in spots and completely tender, about 15 to 18 minutes. Remove and allow to cool. Using a small serrated knife (a tomato knife is perfect for this), cut the peel off the grapefruit. Using the same knife, cut in between the membranes to release the fruit into a bowl. Squeeze the juice from the membranes into a separate bowl and reserve. Cut the peel from the tangerines and then slice them into ½-inch thick slices. Cut the slices in half and put in the same bowl as the grapefruit pieces. Place the crème fraîche in a small bowl and add about 2 tablespoons of the grapefruit juice. Add a pinch of salt and a few grinds of pepper. Whisk well to combine. This will be your dressing. Cut the avocado into chunks and place in a salad bowl. Add the citrus and the carrots. Also add the greens if using. Pour in the dressing and toss to coat gently. Garnish with a healthy sprinkling of the seeds. This salad looks like the perfect late winter salad. I’m with ya! I loooove a good salad! This looks beautiful; I love a good salad recipe and these ingredients are perfect for me. Just found out you’ll be at the Dole Conference, too and I’m so excited to meet you! 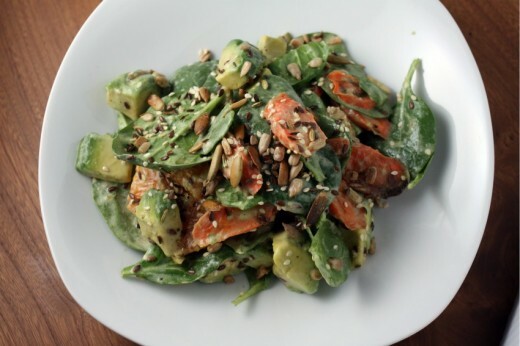 I do love a good salad and this seems perfect for this in-between season! I am so with you on this one! This salad sounds absolutely incredible. It’s been too long since I’ve posted a salad recipe on my blog. You’ve inspired me! well, first of all, I’m definitely going to have to check out ABC kitchen now. I can’t believe I’ve never heard of it! Second of all…I really need to get back on the salad bandwagon. Like…my jeans are begging me. And the only way to stick to it is with fun salads like this! It really does sound like the perfect combination of acid/fat/texture. So delicious. serious eats posted the recipe for this salad. 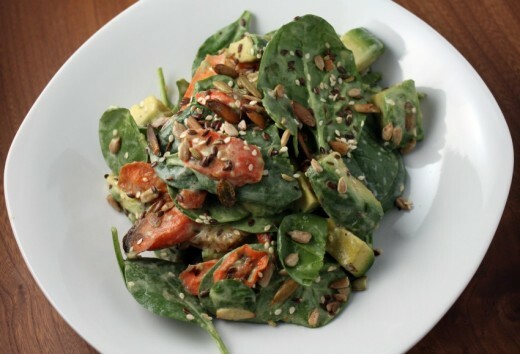 ABC Kitchen is one of my favorite restaurants, and this salad is among the best items there! I eat salads often but this one looks really, really special. I’ve got almost everything except for avocados. I think I’m going to try to like avocados more than just in guacamole, and this looks like a good salad to give it a go! A great all vegetarian restaurant in NYC is Candle 79. I eat there every single time I go to New York, and love, love, love the menu. Look them up online and see if the menu appeals to you. And have a great trip! I cannot believe I never thought of looking at restaurant menus online! 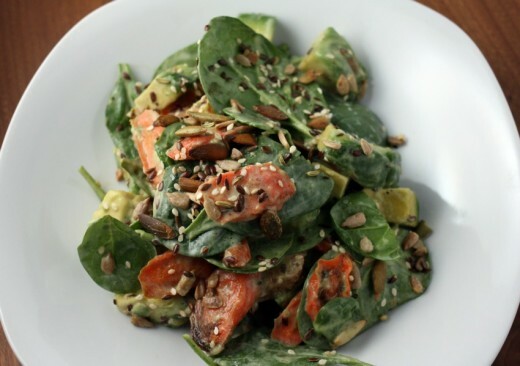 loved your salad, everything about it seems perfect, avocado and roasted carrot, great combo! Mmmm, this salad was so good, Anna! I look forward to making my own sometime soon!